This rare article documents a 100 mile track speed record run that occurred at the Indianapolis Motor Speedway in August 1916. Much was made of America winning back the record from the French, with driver Georges Boillot and his Peugeot. 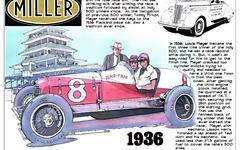 The driver was Willard “Big Boy” Rader and the engineer was Jay Vincent. Carl Fisher and James Allison oversaw the event. Fisher was happy to make himself available to the press. This article reports on a new speed record for cars of 350 cubic inch (I'm not sure, tell me if you know) engines at the Indianapolis Motor Speedway. The car was a Packard using a specially designed aviation engine. The date was August 2, 1916 and the driver was "Big Boy" Rader. The engineer was J.G. Vincent. Much was made of the drive because it was an American car and it displaced a record set by Frenchman George Bolliot in a Peugeot. Ever patriotic Speedway President Carl Fisher celebrated the accomplishment by promoting it.